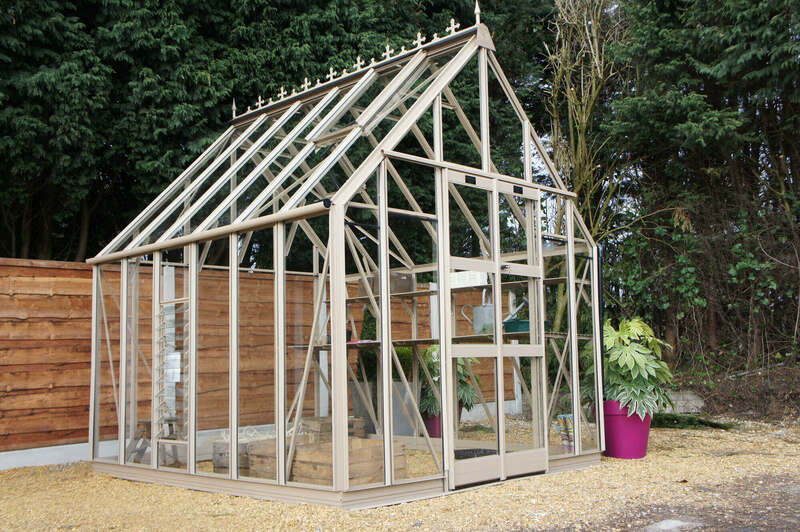 The Zenith by Elite, the latest addition to our incredible range of greenhouses, is a design which is sure to create quite an impression in any garden. Available in any of our nine sublime power coated finishes, as well as the traditional standard alloy, this model offers an amazing amount of growing volume thanks to the incredible roof design. Standing in its 8 feet wide footprint, the greenhouse offers an eaves height of 1583mm found throughout our 8 feet range, and yet the ridge height stretches out to a colossal 3160mm, thus providing a cavernous growing area for taller produce and allows for superb air flow for all crops. Based on the DNA found in the Titan series, arguably the strongest greenhouse on the market, the Zenith has our thickest aluminium bar and has its own unique gutter to collect the rainwater from such a huge roof space and, as standard, is supplied with the rainwater kit, automatic openers on all of its roof vents together with generous double doors with our low threshold access, a 10 blade louvre, canopy seals, cantilevers on every bar and crestings and finials for some added finesse. A truly voluminous greenhouse standing literally head and shoulders above the competition. Prices available on request - give us a call today!